Giuseppe Armani has gained a reputation as one of the worlds leading collectibles sculptors. His work covers a wide variety of subjects, but mainly elegant ladies. Many of his sculptures owe their form to the Renaissance school of art which Armani often follows. There is a growing market for his sculptures and commissions for Disney and a expanding Collectors Society has increased awareness. Armani was born in Calci, not far from Pisa, Italy. He was a gifted artist from a young age and living near great art cities such as Florence was exposed to the works of many famous artists. 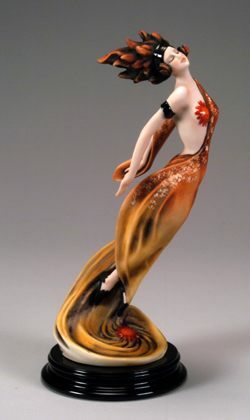 Initially working as a sculptor in an art gallery and later in 1975 forming a relationship with Florence Sculture d'Arte which continues today. The factory of Florence Sculture d'Arte is located at the heart of Tuscany. The figures are produced using the medium of cold-cast porcelain which allows the most minute details of his sculptures to be reproduced. Much of the success of the sculptures is this attention to detail and the quality and beauty of the finished work. The International Florence Collectors Society, the Giuseppe Armani Art Collectors Club (in the UK it was initially called The Florence Society) has recently changed from a subscription to free, but members no longer receive a free joining gift. The International Florence Collectors Society was launched in January 1996, following the success of the experience in the USA and Canada, where the local Collectors' Society, run by Miller Import Corporation, has been active since 1990. 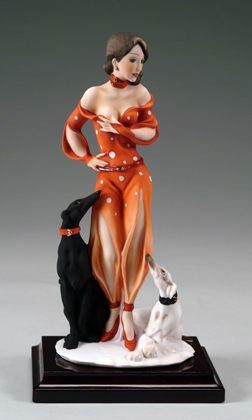 It is the purpose of the Society to provide information, services and benefits to collectors of Florence figurines, creating an effective link between them and Florence Authorized Vendors, with the aim of establishing and strengthening lasting ties between the public and Florence sculptures. For more information visit http://www.florence-sculptures.it. Note: This site is not affiliated with Guiseppe Armani. It is designed to provide information to collectors of Armani Figurines.